Recently returned from an 8 day trip to Kenya I will try to dot down a few thoughts while they are fresh in my memory. I’ve decided to split this into two blog posts. The first is a bit more general about how things work in Kenya, trying to perhaps clear up some confusion that I’ve notice exict amongst both consumers and baristas. I also wanted to touch on prices this year. There’s some confusing about the different names of coffees coming out of Kenya, so I’ll try to explain it briefly. You might have seen names like Mugaga, Tekangu and Gikanda on coffees. These are society names. Each factory is a member of a society. In a lot of cases you can de-code the society name. For example Gikanda is made up from Gichathaini, Kangocho and Ndaroini. Tekangu is Tegu, Karogoto and Ngunguru. Mugaga is an exception to this with Kieni, Gatina, Kiamambara and Kagumoini. Factories are wet mills. They’re just called factories in Kenya. This is where the members, or smallholders as they’re also called, deliver their freshly picked cherries. The factory manager decides when the members should pick. At some factories it’s every week, others every 10 days. Each member is paid 50 ksh pr kilo of cherry upfront and can even get an advance on their expected delivery of cherry, if they have bills to pay before the harvest. After the coffee has been sold the factory know how much they’ve earned, the profits are paid out to the members. By law at least 80% has to be paid out to the members, so running the factory can cost 20% at the most. New drying tables of repairs of machinery will of course make it more expensive to run the factory, but a lot of the better factories are only taking 10-15% of the profits. Last year the members of Kieni was paid a total of 138 ksh pr kilo cherry. Please note that this is cherry of all sizes and densities, and even though they are picked ripe there will still be a lot to sort out. The price paid to farmers at Kieni was some of the highest in Kenya last year. Typically the factories we visited had between 600 and 1000 members. Each member is typically a farmer and his family and can have anything from 40 up to several hundred trees. Some of the larger members hire work for picking, and others manage to pick their own trees themselves with help from the family. It’s the members that choose the board and chairman of the factory. 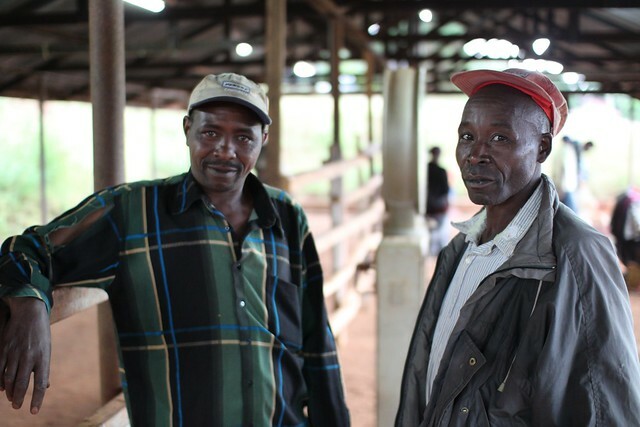 In the Mugaga society (and many other societies) the managers change between the factories every two years. We've decided to identify the coffees we buy with the factory name, as that's the most precise identification of where that particular coffee came from. Naturally, with 900 small farmers delivering cherry we can't identify further where it came from. If you would like to know more certain you can guess it's within an approximate 3 km radius of the factory. The fresh picked cherry is delivered at the factory, where each member’s amount is weighed and they are given a receipt for final payment once the coffee is sold. The cherries are then depulped and put into fermentation tanks. The cherries are delivered in the afternoon and depulping is finished in the early evening. The first fermentation goes on over night while it’s cooler and in the morning the coffee is washed to remove most of the mucilage. It is then moved into a second fermentation tank. Here it stays for 12 to 48 hours for the second fermentation. After that the coffee is washed in channels with lots of clean water to remove the last mucilage and ensure it is clean. Then the coffee is put in soaking tanks for 10 to 18 hours before finally going to the drying tables. At this point the beans are around 50% moisture and over the course of approximately 10 days it is dried to around 11% moisture (10% if you count the parchement). It’s important that the beans aren’t exposed to hard direct sun light, as they will then crack from too fast drying. 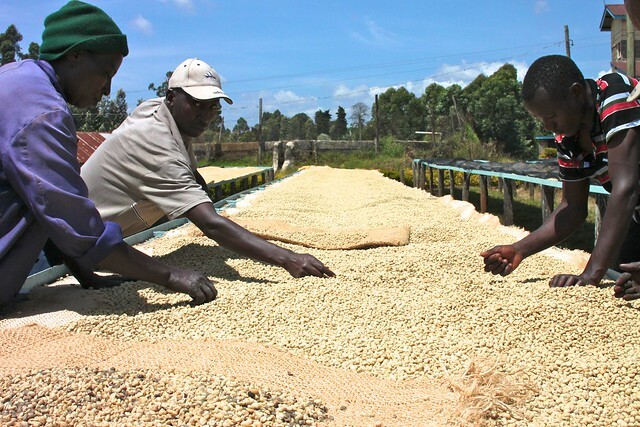 The rasied beds used in Kenya unsure good airflow from underneath and turning the coffee often will help a uniform drying. Some mills use a moisture meter to determine when the coffee has dried. But much like an un-calibrated Extract Mojo this can be dangerous to trust. Properly calibrated it can be a great tool though. Lots of millers will determine it by look and feel, though, and can get it just as precise. After drying the coffee needs to rest for about 2 weeks before it is delivered at the Dry Mill. 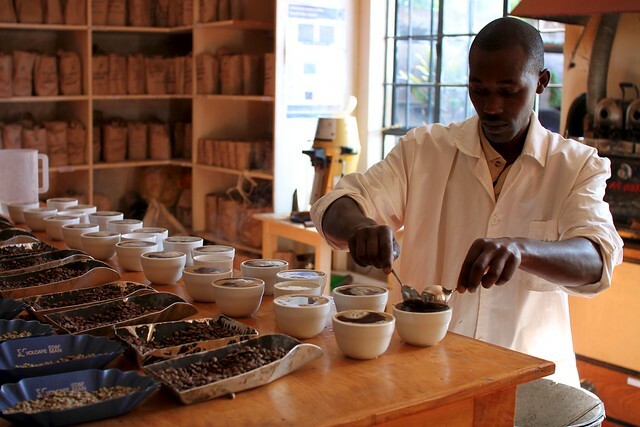 This is our hub for quality coffee from the central region in Kenya, including of course Nyeri. The coffees we’ve cupped come through this mill and we like to do a lot of cupping here. It means we can evaluate the coffees close to the facotories and cup them as soon as they arrive. At the dry mill the coffee is hulled, sorted for size and density - AA, AB, C, PB, T, TT and UG (Un.Graded), and finally sorted for defects. We pay an extra premium for an additional hand sorting on top of the electronic sorting, as well as for vacuum packing in stead of jute bags. All these costs are on top of the price we pay directly to the farmers, on a separate contract to avoid any confusion. Last years prices were at an all time high, due both to very high global market price, but especially because of the unusual low harvest last year. Low supply and high demand simple drew prices up. This was good news for farmers, who would otherwise (with a low harvest) have lost a lot of money. In stead it turned out to be invigorating news for many smallholders. Once again they could see that it can be profitable for them to produce coffee. Many farmers we talked to on the trip have told us that a few years ago they were uprooting coffee trees and changing to other crops, like banana or maize. But with last years high prices they feel that coffee can be a profitable crop and more importantly young people can see a future in growing coffee. This of course is significant for us as coffee roasters, and once again stresses why roasters need to make sure that the farmers are paid well for their coffee. This year the prices will probably go down quite a bit. The harvest is more than double of last year and there are lots of AAs (the largest size beans, which fetch a higher price). I do hope prices won’t drop all the way back to what they used to be a couple of years ago. Even though we paid a high price back then, it’ll be a blow to the feeling of economic rise that the farmers have seen in the horizon. On the other hand the price for the top lots last year, were so high that many roasters didn’t feel that was sustainable for them as well. I believe that we need to prepare our customers to pay that kind of prices for that kind of quality. We cannot expect farmers to produce quality if consumers are not willing to pay for it. Lovely post, and lovely pictures. Welcome home! This is very insightful. Thank you for taking the time to write this.